Note: Below is a Fantasy NASCAR Las Vegas Motor Speedway preview article from Wheels (@DK_Wheels) and PJ (@PJFrapDFS) of the Power Hour DFS (@PowerHourDFS) crew. Race number three of the NASCAR Monster Energy Cup Series kicks off the West Coast swing as we head to Las Vegas Motor Speedway this weekend. Last Vegas is an intermediate track, but we don't expect to see tires fall off like they did last week in Atlanta. Goodyear made some minor updates to the tire used in 2017 and these were tested back in January, so teams do have some data on what to expect as far as tire wear heading into the weekend. One of the story lines before the race even started last week was with Martin Truex Jr. and him failing to pass pre-qualifying inspection, resulting in him starting P35. Let's hope we can avoid any inspection issues this week! The weather looks to be in the mid 50's as a high this weekend, so expect to the track to be extra grippy and the fast laps to correlate well with laps led this week. Before we dive into who we like this weekend (pre-qualifying) for Daily Fantasy Sports (DFS) Fantasy NASCAR, lets take a look back at how last years race played out. We saw the front row of Brad Keselowski (P1) and Martin Truex Jr. (P2) lead 239/267 laps before Martin Truex Jr. ended up bringing home the checkered flag. No one driver outside of the top 3 scored more than 9 pts of 5% of the total Dominator pts. Jimmie Johnson - The ALL time wins leader at Las Vegas Motor Speedway with four wins. But Jimmie finds himself looking up in the standings to Jeffrey Earnhardt, Gray Gaulding and even Mark Thompson & DJ Kennington who didn't even show up to Atlanta to race. He will be looking to rebound after the in-ability to bring a clean race car home in one piece after four races this young season (The Clash, Duels, the Daytona 500 and again at Atlanta). Brad Keselowski - Brad has run really well here at Las Vegas over the years, especially over his last five races. During those five races he has finished no worse than 7th, including two wins and recording laps led in all of those races during the stretch. He had a solid race at Atlanta where he was rather low owned, so expect the recency bias plus his track history to make Brad a very popular and high owned play this weekend. 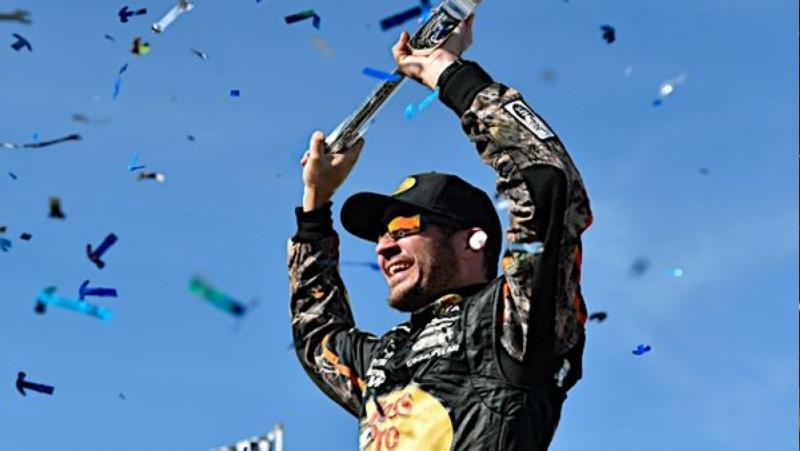 Martin Truex Jr. - Martin checks every imaginable box needed to be yet another solid play week after week, but even more so at all of the intermediate tracks. Coming off his race win and seeing him able to drive from P35 up to P2 in stage 1 last week, you can just tell that this team hasn't lost a step in the offseason that was celebrated with a championship. This will be another week that you'll look to roster 2-3 Dominators in each lineup and IF you can fit a 4th into your lineup without completely punting, wouldn't be a terrible move. This is because at Las Vegas, you typically see the cream of the crop not only qualify near the top, but also finish near the top and because of that it is common to see 3-4 guys in the top six overall scores come from starting positions inside the top 10. Martin Truex Jr. ($10,500) - Martin led 150 laps here last year on his way to his win. Even has a pair of top 10 finishing while driving for Michael Waltrip racing (he is really good here). Brad Keselowski ($9,400) - Las Vegas is Brad's best track according to driver rating. Lead 89 laps here last year and should have won the race (motor issue inside of five laps to go). Has five straight top 10's and has led in each of those races. Martin Truex Jr. ($10,500) - Martin absolutely dominated last year and the team downsized from two cars back down to one and are "over-staffed" in the garage… There is zero reason to believe he slows down this year, especially out of the gate. As stated last week, he averaged 95.5 DK points at intermediate tracks last year, which was 31.6 points higher than the next closest. Martin won this race last year while being the top overall DK scorer with 115.5 points. Kevin Harvick ($10,300) - On paper, Brad Keselowski needs to be considered a top dominator option at Las Vegas but I am giving the slight nod to Harvick here as my second dominator. Harvick was the class of the field all weekend in Atlanta, and we've seen him be the class of the field in Las Vegas, like when he won the 2015 race while racking up 138 DK points. His ownership will be interesting, because recency bias of his dominating Atlanta win is fresh on many minds but his Las Vegas numbers took a hit after crashing and finishing P39 last race here. Kasey Kahne ($6,200) - This is Kahne's best track for his career when it comes to average finishing position. Add in 10 straight top 20 finishes at his price and he is looking to be a nice value play. Paul Menard ($6,900) - This is also Menards best track for his career when it comes to average finishing position. Similar to Kahne, he has strung together eight straight top 20 finishes. Ryan Newman ($7,100) - This price is tooooo LOW… period! Ryan has scored 31+ in six of his last seven Las Vegas races, including four straight. Ryan is averaging a smooth 41.5 over his last three and as long as he doesn't park himself on the front row again, he is setting up to be a solid value play this week. Paul Menard ($6,900) - Averaging 35.8 DK pts all time here at Las Vegas. Based on his price this week, Paul has hit 5x value in six of his last eight topping out with a 70 point outburst back in 2014. Michael McDowell ($5,500) - Scored 10 top 25 finishes at intermediate tracks last year and that is all you are really looking for from a punt. His lone top 20 at Las Vegas came just last year. Michael McDowell ($5,500) - I promise you, his price will not stay in the punt play section for long (under $6k), so take advantage while you can! Honestly, McDowell's biggest concern each week is that he qualifies too high, but even then you can't count him out with the cost savings that you are getting for a punt play that frequently finds the top 20.